The county map from the Britannia Depicta or Ogilby Improved (John Ogliby had been published the first British road atlas in 1675) published by Thomas Bowles in 1720 measuring 11.5 x 11.5 cms (4.5 x 4.5 ins). 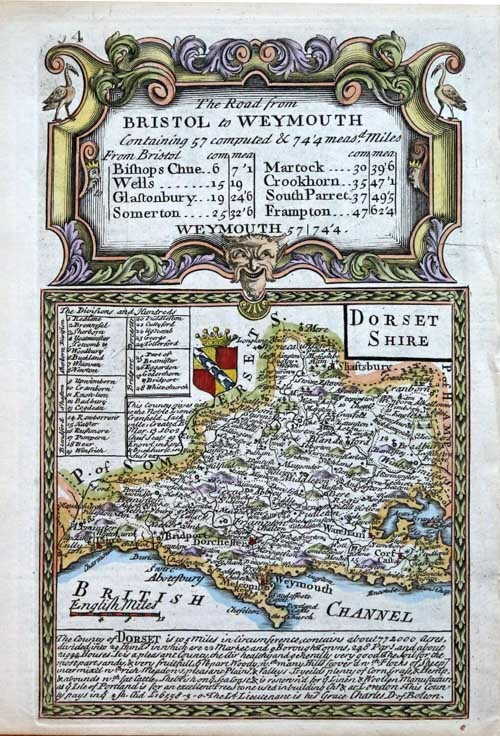 At the top of the page is a decorative cartouche containing details of the road from Bristol to Weymouth with distances in computed and measured miles (57 and 74.4 respectively – google has the distance today as 69.5 miles). Includes the coat of arms of the Earl of Dorset, at that time Lionel Cranfield Sackville KG PC (1688 – 1765) an English political leader and Lord Lieutenant of Ireland. Also shown are the hundreds. Beneath the map is a statistical summary of the county covering size, towns, industry and commerce: “a pleasant county the air healthy and generally very good”. A single digital photograph of an original.